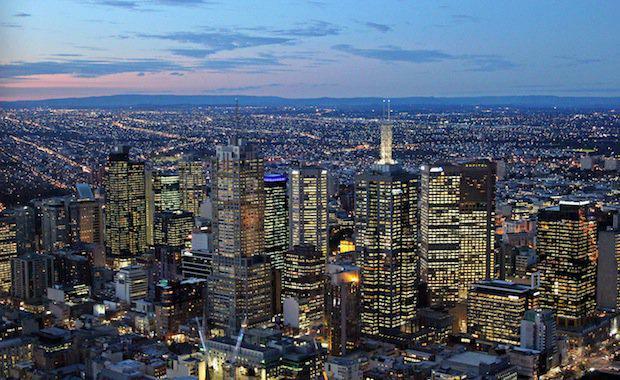 A leading industry report has found Melbourne is slowly becoming denser than some of the world's most crowded cities, including Hong Kong, New York and Tokyo. The report by the Oliver Hume Real Estate Group shows that there is a growing trend toward designing smaller apartments per square metre, and developing super structures that allow for more units per tower. The average size of a one-bed apartment decreased from 47 to 44 square metres, while two-bedroom apartment sizes fell from 62 to 59 square metres in the final quarter of 2014, the Australian Financial Review reports. Two years ago, the average size of a new one-bedroom Melbourne apartment peaked at 55 square metres, while the average size of a two-bedroom apartment was more than 70 square metres. An independent report by Leanne Hodyl, a co-ordinator of city plans and policy at Melbourne City Council, argued that Melbourne must establish far tighter CBD density rules, greater separation between towers and stricter design standards. Ms Hodyl said Melbourne's hyper-dense skyscrapers were being built with little regard to residents, the impact on the streets below or the value of neighbouring properties, because of "weak, ineffective or non-existent state government policies". "It will create a legacy of…homes that lack access to light, air … and that diminish the quality of the streets and parks below," the report says. Ms Hodyl argued that Melbourne must establish far tighter CBD density controls; greater separation between towers; and far stricter apartment design standards. The city must also introduce "density bonuses" so developers can get "hyper-dense" apartment tower approvals only if they offset them with new open space or other benefits, her report says. A spokesman for the Andrews government told the Australian Financial Review a new planning authority would work with the State Architect and Melbourne City Council on new high rises to "restore accountability" to CBD planning.